It may only stand four inches tall, but the Ashes urn was given VIP treatment with a first-class seat and security guards as it embarked on its journey to Australia. It is only the third time the ceramic trophy has left Lord's since 1927, when it was donated by the widow of Ivo Bligh, the England captain given it in 1882-3. It has reportedly been insured for a seven-figure sum for its 26,000-mile round trip to six Australian cities to coincide with this winter's mouth-watering series Down Under. But whatever the outcome, the Ashes will head home to the MCC Museum at Lord's. 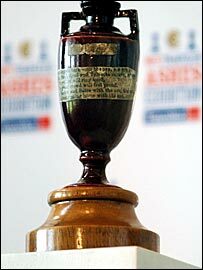 The Ashes urn relates to The Oval Test of 1882 when Australia, having been bowled out for 63 in the first innings, beat England by seven runs, their first win on English soil, prompting the infamous mock-obituary of English cricket in the Sporting Times. When Bligh, who did not play in that match, travelled to Australia the following winter, he was presented with the urn, thought to contain a burnt set of bails, by a group of women from Melbourne. The urn was to have travelled with the England team on the last Ashes Tour in 2002-3, a series which England lost 4-1, but was deemed too unstable. It received a careful restoration in 2004, when a number of hairline cracks were repaired, mainly at the base of the ancient wooden symbol. MCC curator Adam Chadwick, who will accompany the urn in Australia, admitted he expected pressure from Australians to leave the urn down under. But he added: "That comes with not knowing the true story and the true history. "It was a gift, a symbol of rivalry but also of friendship. It was not meant to be a trophy. Having given it to us, it would be wrong to ask for it back."